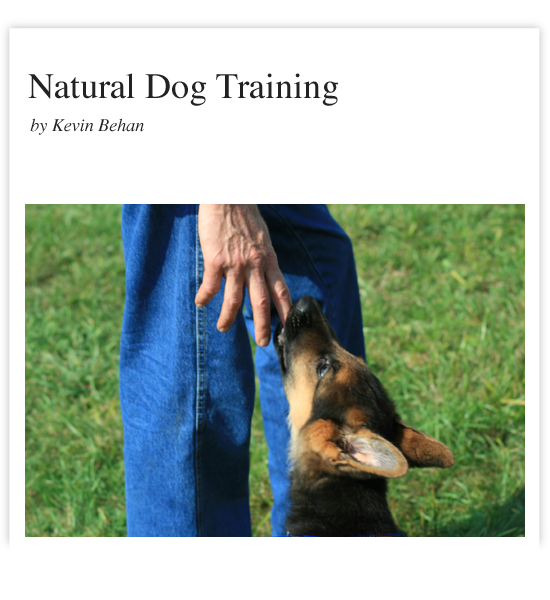 Natural Dog Training is the best dog training book I've seen; it's pure brilliance to use the dog's natural instincts to make the dog want to do what you want him to do. And the dog loves it, and understands you're on his side! This is a great book, a canine psychology book, a training book, an everything book. I've read and done alot (agilty, freestlye, clicker,obdience, hunting) and in this book there is something for everyone who loves and lives with dogs. This method of training really works in a real life every day run of the mill home. It is presented in a clear, concise easy to understand way that explains the theory, gives examples and provides easy to follow step by step directions while addressing a variety of issues that may apply to you and your dog. ... This book is the only book you need to raise the best companion you will ever have. This book has changed the way I look at and understand my dogs. This isn't the kind of book you can read in one weekend - I find that I need time for the ideas and theories to soak in fully, then I will re-read again. Even if you don't intend to train your dog using Behan's methods, the dog training community should be giving credence to his understanding of dogs and how they feel. Kevin grew up training dogs alongside his father, John Behan , one of the Nation's first professional, family dog trainers. Kevin developed the Natural Dog Training theory after noticing the similarities between how well behaved and orchestrated wolves hunt in a group and the cooperation required in high drive police dog work. Kevin has worked with thousands of dogs throughout his long career, operating his own boarding and training kennel in Connecticut as well as advanced training for security, protection training and police dog work for K9 units and hospital security. Along with delivering hundreds of lectures and seminars on obedience, training and the theory of Natural Dog Training, Kevin specializes in working with aggressive dogs and their rehabilitation, saving hundreds of dogs from being put to sleep. Currently Kevin is working on a new book, training dogs (and people) in beautiful Southern Vermont.